In September, 1990, the Church of Nigeria Anglican Communion declared a missionary Diocese for Calabar covering the entire Cross River state. The Cathedral Church of the Holy Trinity was also declared as the Bishop’s seat. At the onset, the new Diocese of Calabar had just a few churches mainly because of population and already saturated membership of other denominations in the metropolis and immediately outside. It became a challenge to establish more churches. Most of the existing churches existing within the Diocese were majorly situated in the Northern part of the state such as Ogoja, Ikom and Abi Local Government Areas. They were, as a matter of fact, inherited from the Diocese of Enugu. The new Missionary Diocese of Calabar was therefore faced with the major challenge of how to create and found more churches especially in the southern part of the state and particularly in Calabar Municipality. It is in the spirit of this desire that in March 1991, a few members of the Cathedral Church of the Holy Trinity, Calabar, saw a need to establish a new Anglican Church at a place outside the Cathedral and closer to the worshippers. Soon, a small congregation of Anglican Christians was formed at Efio–Ette/MCC Junction, Calabar. Its leaders approached late Mrs Iyamba George, a former Lay-Reader in the Cathedral, for permission to use one of the classrooms in her Nursery/Primary School building at Ikot Nsisuk, near Efio-Ette/MCC Junction, Calabar. She happily granted the permission. The Church was named after St. Jude’s Anglican Church, Odiolowo, Mushin Lagos, which sponsored the Anglican Diocese of Calabar as a Missionary Diocese. In 1993, as the Church began to grow and as members increased, there was a serious search for a permanent site. During the search, consideration was given to space suitability and comfort. The acquisition of the permanent site involved a protracted struggle, disappointments and God’s eventual intervention. With the cooperation of the Parochial Church Committee, the unrelenting effort of the then Priest and the support of Lady Andem Okpo Ene, the Chiefs of Ikot Ishie and Ikot Effiong Nta, who had been for long in court over the land, agreed, by way of compromise, to lease out the disputed land to the church to ensure a lasting peace, and put an end to their dispute and bring God’s blessing on the land. After this, serious work of building the site also commenced with the dedicated effort of the then Rev. 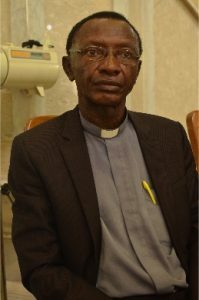 John Ezirim (later Bishop of Aba Ngwa North Diocese), (now late), who led the members to trust God as they all generously donated towards ensuring that the building was put in place. They tasked themselves in giving and within a short while the building was standing. All these were under the leadership of the pioneer Bishop of the Diocese, Rt. Rev. Dr. W.G. Ekprikpo. In the compound of St. Jude’s Anglican Church now, is the Church building, (now being reconstructed to a larger Church); a storey building for a Parsonage; storey buildings for Nursery/Primary Schools; office complex; and another two storey building under construction for more classrooms in the school. They have also purchased ten plots of land for a Secondary School and Anglican Church within Calabar under the leadership of the Ven. John Uka and other Pastors who have laboured together in the church and the Archdeaconry. As at now, St. Jude’s Anglican Church, Ikot Effiong Nta, Calabar is the Headquarters of Calabar Archdeaconry with not less than 32 Churches. It has also given birth to two Deaneries namely: Ascension Deanery and Efut Deanery.